Now we want to see them in action! In the video below, Matt shows us how he passively harvests rainwater in his permaculture system using Swales. This is a topic we cover extensively during our Permaculture Design Courses at the Urban Permaculture Laboratory in Italy. Matt explains that by marking the land using an A-frame level, you can dig ditches that follow the contour of the terrain. You can build simple canals or ditches that are contoured with the landscape, to prevent water from running or eroding the topsoil in your permaculture farm. The soil you will get from the canal, can be placed on the side and serve as a berm so when it drains, and the water accumulates on the canal or the Swale, the berm will prevent the water from eroding the soil. The water will also slowly percolate in the soil, keeping the moisture level high. As you start harvesting rainwater using the Swale you need to plant ground cover together with legumes, fruit trees and herbs. This is the key for Swale success. 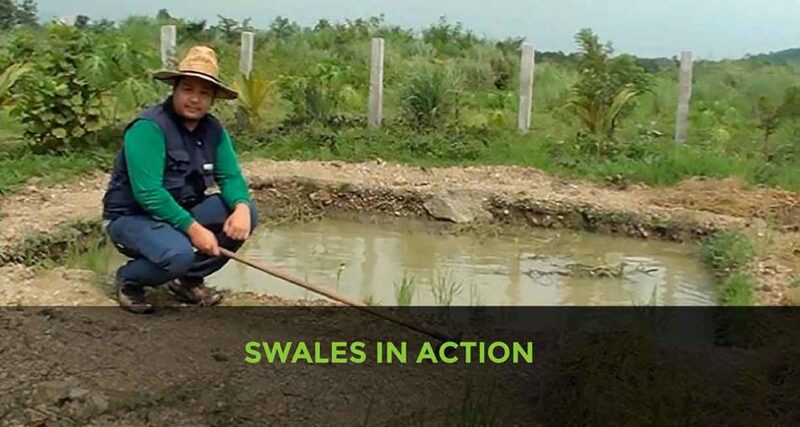 Enjoy the video below to see Swales in action: by simply contouring the ditches or shaping the land on contour you can passively harvest rainwater with ease. Be sure to share this post to inspire your friends and family to easily and passively harvest rainwater with Swales!